Objectives To determine the influence of different buffers, pH and meropenem concentrations on the degradation rates of meropenem in aqueous solution during storage at 32°C, with the aim of developing a formulation suitable for 24-hour infusion in an ambulatory elastomeric device, compliant with the latest National Health Service Pharmaceutical Quality Assurance Committee Yellow Cover Document (YCD) requirements. Methods Meropenem was diluted to 6.25 mg/mL and 25 mg/mL in aqueous solutions adjusted to various pH with phosphate or citrate buffer and assessed for stability. Meropenem concentrations were determined using a validated stability-indicating high-performance liquid chromatography method at time 0 and following storage for up to 24 hours at 32°C as per the YCD requirements. 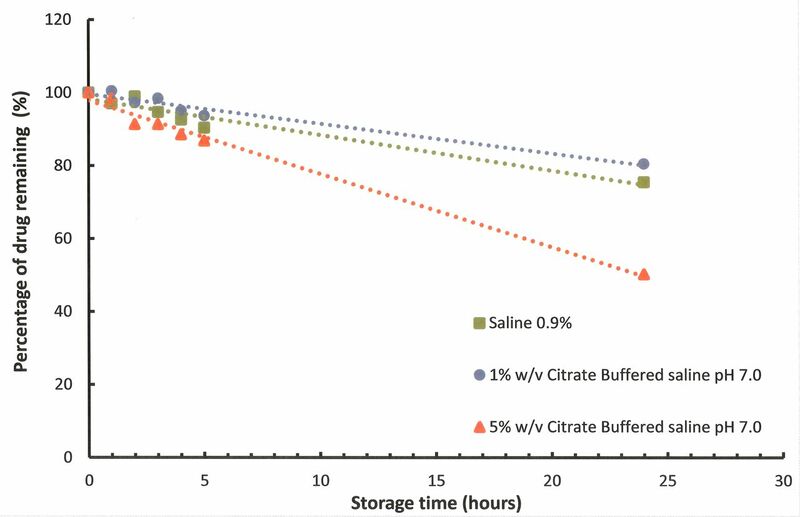 Results Degradation was observed to be slowest in citrate buffer around pH 7 and at a meropenem concentration of 6.25 mg/mL; however, losses exceeded 10% after storage for 24 hours at 32°C in all of the diluents tested in the study. Conclusions Meropenem at concentrations between 6.25 mg/mL and 25 mg/mL as tested is not sufficiently stable to administer as a 24-hour infusion in ambulatory device reservoirs. If the YCD 95% minimum content limit is applied, the infusion period must be reduced to less than 6 hours for body-worn devices, especially at the higher concentration studied (25 mg/mL). This limits the possibility of using elastomeric devices to deliver continuous infusions of meropenem as part of a wider outpatient parenteral antimicrobial therapy service. Meropenem is known to be relatively unstable after reconstitution and dilution in 0.9% saline or 5% glucose. Degradation rates are relatively high and present challenges when assigning a practical shelf-life to injections in ready-to-administer containers.7 8 Infusion periods not exceeding 12 hours have been reported. This is especially true for ambulatory devices which require supporting evidence for solutions stored at 32°C throughout the administration period to be compliant with the UK National Health Service (NHS) Yellow Cover Document (YCD) requirements.9 All previous studies have been conducted using 0.9% saline as diluent. Meropenem stability has been shown to be influenced by temperature,7 pH10 11 and drug concentration.7 12 The apparent optimum pH for stability is approximately pH 6.7 Degradation rates also increase at higher concentrations, which is of particular relevance when treating multidrug-resistant infections. The chemicals used were high-performance liquid chromatography (HPLC)-grade acetonitrile, CAS 75-05-08 (Fisher Scientific, Loughborough, UK), orthophosphoric acid (Fisher Scientific), sodium phosphate dibasic (Acros Organics, Geel, Belgium), tri-sodium citrate dihydrate, CAS 6132-04-03 (Sigma Aldrich, Dorset, UK), and citric acid, CAS 5949-29-1 (Fisher Scientific), all of analytical grade. Milli-Q >18 mega-Ohm purified water was generated in the laboratory (Elix Merck Millipore, Watford, UK). Meropenem powder for injection (Demo SA, Noriderm Enterprises, Nicosia, Cyprus) was supplied by the Royal Derby Hospital pharmacy stores. Citrate (0.3% w/v) buffered sodium chloride pH 7, 100 mL, was supplied by Preston Pharmaceuticals (Royal Preston Hospital, Preston, UK). A stability-indicating liquid chromatography method employing a Thermo Scientific Ultimate (U3000) HPLC System with diode array ultraviolet detection and Chromeleon V.6.8 software operating under Windows 7 was adapted from a published method.11 The HPLC column was a Kinetex XB 2.0 µm C18 100 A, 100×2.1 mm (Phenomenex, Macclesfield, UK): mobile phase 90:10, 0.05M potassium dihydrogen orthophosphate adjusted to pH 3; acetonitrile: flow rate 0.2 mL per minute; injection volume 10 µL; detection wavelength 298 nm; acquisition time 5.0 min; column temperature ambient; and autosampler temperature 5°C. Phials of meropenem powder 1 g were used to prepare low-concentration and high-concentration solutions (approximately 6.25 mg/mL and 25 mg/mL) in triplicate in a variety of solutions. Solutions were placed in 30 mL universal containers (Fisher) protected from light and stored at 32°C in a fan-assisted thermostatically controlled incubator (Sanyo Medical). At each time point, 100 µL of the sample was withdrawn, diluted in the same buffer to contain approximately 0.1 mg/mL and analysed by HPLC. A small aliquot (approximately 2 mL) was transferred to a universal tube for pH determination. The following buffers/pH values (adjusted with citric acid) were tested: 0.9% w/v sodium chloride (unbuffered control), 0.3% w/v sodium citrate buffer pH 7, 0.5% w/v sodium citrate buffer pH 6, 1% w/v sodium citrate buffer pH 6, 5% w/v sodium citrate buffer pH 6 and 5% w/v phosphate buffer pH 6. pH was determined using a glass combination electrode and Orion 420A pH metre calibrated using National Institute of Standards and Technology traceable standards (Thermo Fisher Scientific, Loughborough, UK). Meropenem standards (n=2) containing 0.1 and 0.05 mg/mL were prepared in water and injected (n=6) at the beginning of an HPLC run to demonstrate system precision, and 0.1 mg/mL employed as a bracketing standard throughout the analysis. All standard and test samples were prepared and injected in triplicate. Samples were stored at 5°C during HPLC analysis and were completed within 12 hours of sample preparation to avoid additional degradation. Linearity of detector (LOD) response was demonstrated over the range of 0.01–0.20 mg/mL with R2 values (correlation coefficient) of 0.9997–0.9999 (n=4). The LOD was 0.097 µg/mL and limit of quantitation 0.295 µg/mL. Precision and accuracy assessments were performed with triplicate injections at a concentration of 0.1 mg/mL. The mean % relative standard deviations were 0.18% (n=12) and not greater than 0.4% (n=4), respectively. To show the method was stability-indicating, a forced degradation study was performed under the following conditions: 0.1M hydrochloric acid, 0.1M sodium hydroxide and 3% v/v hydrogen peroxide. Meropenem was prepared in each of the three chemically forcing solution conditions, stored at 50°C, sampled immediately after preparation and after 30, 60 and 120 min. The peak purity of the active meropenem peak was evaluated stored in hydrochloric acid and hydrogen peroxide by generation of a peak match using the Chromeleon V.6.8 software, where the spectra of the peak are compared with a reference spectra at three positions—front (50%), top (100%) and end of peak (−50%)—and scored from 1000. The relative SD of the peak match was also calculated. All spectra had a score match >900 and low RSDs. The above supports the method being stability-indicating for meropenem. A stability-indicating HPLC diode array method was developed to fully separate all degradation species from the active meropenem. An example of a typical chromatogram showing separation of the active meropenem peak at a retention time of 2.3 min from all degradant peaks is shown in figure 1. 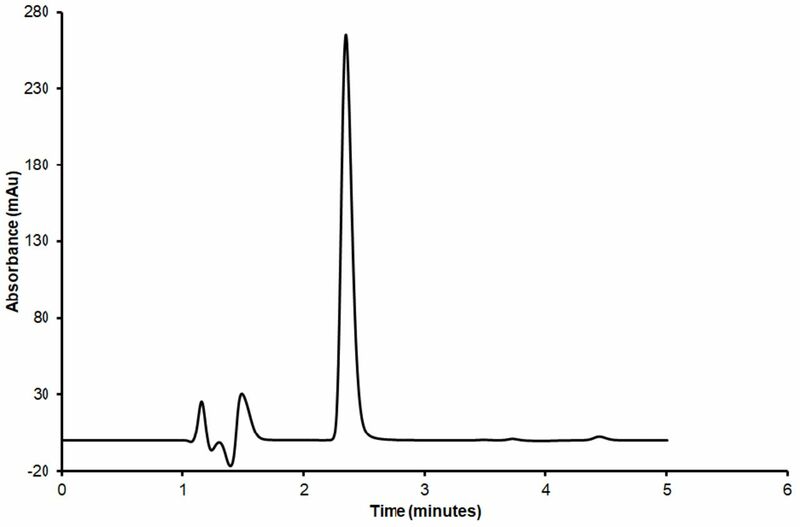 A typical chromatogram of meropenem (retention time 2.3 min) at 1 mg/mL under forced degradation conditions of 0.1M hydrochloric acid after 5 min incubation. Detection performed at 298 nm. In solutions in 0.1M hydrochloric acid stored at ambient temperature, the meropenem peak area had reduced by greater than 90% after 30 min storage. Degradation peaks were noted to be fully separated from the meropenem peak. In 0.1M sodium hydroxide, it was observed that no additional degradation peaks were detectable at time 0 and degradation took place at a slower rate than occurred under acid conditions. In 3% v/v hydrogen peroxide, more than 90% degradation occurred after 30 min storage. The degradation peaks were clearly resolved under each stress condition from the meropenem peak. Acid and alkali degradation produced the same degradation product. Peak purity for the meropenem peak with generation of a peak match under each stress condition was performed using Chromeleon V.6.8. The spectra of each peak were compared with the reference spectra at three peak positions—front (50%), top (100%) and tail (−50%)—and scored from 1000. The relative SD of the peak match was reported. All spectra had a score match >900 and low RSDs. The above supports the method being stability-indicating for meropenem. Meropenem degradation was assessed at different time intervals during the first 5 hours following preparation and at 24-hour storage time to determine the kinetics of the degradation reaction. The results show that meropenem after reconstitution and dilution in aqueous solution is unstable, the degradation rate resulting in between approximately 20% and 56% loss after 24 hours at 32°C (figures 2 and 3). Degradation rates at 32°C of low-concentration meropenem (6.25 mg/mL) in different buffered diluents. Degradation rates of high-concentration meropenem (25 mg/mL) at 32°C in different buffered diluents. Meropenem content and pH values before and after storage at 32°C for 24 hours in different buffered diluents are shown in table 1. 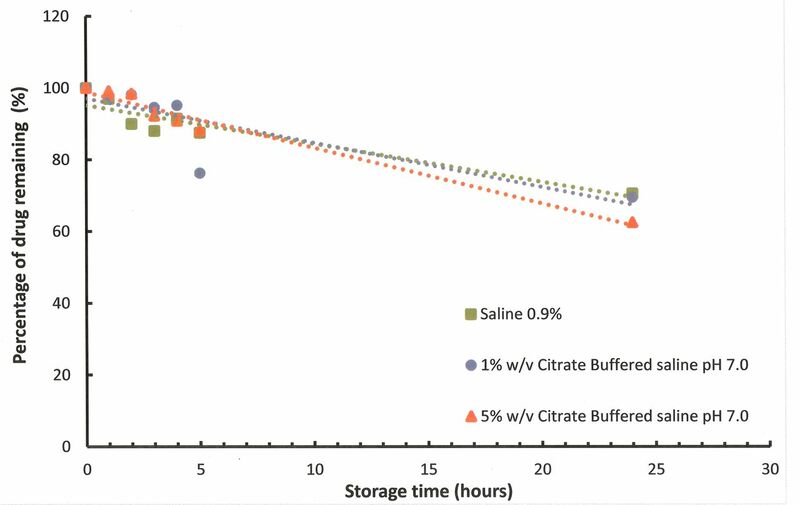 Meropenem after reconstitution and dilution in aqueous solution was unstable, with ~56% degradation loss recorded for low concentrations prepared in 5% w/v citrate buffered saline pH 6 after 24 hours at 32°C. Meropenem was less stable in phosphate buffer, even when the pH was approximately 6.0, the optimum pH for stability. In solutions buffered using citrate, all the solutions showed higher pH values after adding meropenem. In contrast, phosphate-buffered solutions reflected the buffer pH more closely. The greatest losses of drug were observed at the higher meropenem concentration. Analysis of % meropenem remaining at T=24 hours was performed using a paired t-test with equal variance for the data using 0.9% saline unbuffered as a control. At 25 mg/mL the greatest difference (loss) in % meropenem remaining at T=24 hours was identified in 5% phosphate-buffered pH 6.0 using the t-test (p=9.15×10−12). The null hypothesis that there was no significant difference was therefore rejected. Meropenem at 6.25 mg/mL prepared in high-strength buffers (5% citrate and phosphate) resulted in significant loss of meropenem compared with the saline confirmed with a t-test (p=2.4×10−8, p=7.5×10−10) for citrate and phosphate, respectively. Meropenem is an attractive candidate for use in OPAT services as its broad spectrum of activity includes many clinically significant multidrug-resistant pathogens, such as Pseudomonas aeruginosa and extended spectrum beta-lactamase-producing Enterobacteriaceae.12 The British Society for Antimicrobial Chemotherapy manages an OPAT-centred initiative (www.e-opat.com) that aims to support the development, quality and cost-effectiveness of OPAT services through development and promotion of OPAT service good practice recommendations,13 14 development of a national outcomes registry and promotion of antimicrobial stewardship within OPAT.15 Fundamental to these initiatives is the availability of robust drug stability data to support the use of antimicrobial agents in OPAT services, when drugs are given as extended infusions in elastomeric devices. The present study has been conducted in accordance with the temperature requirements of the YCD9 and was intended to assess the stability of meropenem at two clinically relevant concentrations in saline and buffered saline solutions that could be used in clinical practice. The main degradation pathway for meropenem in aqueous solution is through the opening of the beta-lactam ring. The drug was designed to have higher chemical stability than non-1-beta-substituted carbapenem drugs through decreased basicity and nucleophilicity of the basic part of the C-2 side chain.16 The degradation rate is influenced by the concentration of meropenem in the solution, with degradation rates higher at the higher concentration tested across all of the buffered and unbuffered solutions tested, which can be attributed to intermolecular aminolysis through the C-2 side chain of one meropenem molecule undergoing nucleophilic attack of the beta-lactam carbonyl of a second molecule of meropenem. It must be concluded from all these results that meropenem is too unstable to include in services requiring extended storage in infusion ambulatory devices. In addition, the rates of loss are too great to assign a 24-hour infusion period, even when prepared immediately before commencing administration. If the YCD 95% minimum content limit is applied, the infusion period must be reduced to less than 6 hours, especially at the high concentration studied (25 mg/mL). Storage at 2°C–8°C prior to administration would add to the degradation losses of meropenem.10 Calculations for the meropenem degradation rate of minus 1% per 24 hours at 4°C are consistent with the published rate constant by Takasu et al.10 Attempts to improve meropenem stability by the use of buffering have failed to make sufficient improvement to degradation rates to support 24-hour CI of meropenem. For safe and effective use of meropenem in the OPAT setting, reconstitution and intermittent administration by either healthcare workers or trained patients/carers are recommended. Changing the meropenem ambulatory device every 6 hours, the likely requirement to keep degradation below the 5% allowed in the YCD, is likely to be unrealistic for many OPAT services. Franceschi et al studied meropenem at 5 mg/mL and reported stability for CI for up to 8 hours providing the temperature was kept between 25oC to 35oC7. Under these conditions >90% of meropenem remained at the end of administration satisfying the European Pharmacopoeia requirements. Manning et al reported clinical outcomes in a cohort of 50 patients with a variety of infections receiving CI of meropenem in elastomeric devices, the majority of which were not cooled, with 8 patients (16%) being cured, 33 patients (66%) demonstrating improvement while 9 patients (18%) failed treatment over a six year period.12 In their stability studies of 1% and 2% meropenem solutions in cooled and uncooled devices, losses ranged from 10 to 27%. Modelling work showed that the uncooled 2% infuser would deliver 87.2% of the maximum deliverable dose. Our conclusion is that meropenem is insufficiently stable to allow for continuous infusion in elastomeric devices for time periods exceeding 6 hours, based on YCD and British Pharmacopoeia requirements. Data from Manning et al suggest that a lower threshold of stability may be acceptable in clinical practice, but we would urge caution until there is a better understanding of the degradation products of meropenem, and any likely clinical impact. There is scope for a re-examination of pharmacopoeial standards for stability of meropenem and an international consensus on what is safe and acceptable in clinical practice. Meropenem is a broad-spectrum antibiotic used to treat serious infections in hospitals, particularly those caused by multidrug-resistant Gram-negative bacteria. The pharmacokinetics/pharmacodynamics characteristics of meropenem suggest that a continuous 24-hour infusion would be advantageous and would suit many outpatient parenteral antimicrobial therapy (OPAT) services. Meropenem is known to be unstable in aqueous solution, which limits its potential for OPAT. It was not possible to stabilise meropenem using a variety of buffered solutions such that >95% of the meropenem remained at the end of the administration period. The latest National Health Service Pharmaceutical Quality Assurance Committee Yellow Cover Document (YCD) requires that >95% of the API should remain at the end of the administration period. Maximum infusion time should be limited to no more than 6 hours to limit the loss of meropenem to <5% and comply with the YCD, rendering meropenem unsuitable for most OPAT services where a once daily infusion of antibiotic is preferred. The authors would like to thank all members of the BSAC Drug Stability Working Party who contributed to the study and production of the manuscript. The BSAC Drug Stability Working Party comprise CJ (Chair), Mark Gilchrist, TH, Mark Santillo and Andrew Seaton, and representatives from the stability testing laboratory, MCA and A-SW.
. Pharmacokinetic/pharmacodynamic parameters: rationale for antibacterial dosing of mice and men. Clin Infect Dis1998;26:1–10. quiz 1-2. PharmaceuticalNHS CAQ. Standard Protocol for Deriving and Assessment of Stability, Part 1: Aseptic Preparations (Small Molecules), Edition 4, April 2017 (Yellow Cover, 2017. EAHP Statement 5: Patient Safety and Quality Assurance. Contributors A-SW and CJ planned the study. DS and AW performed the study and collected the data. A-SW, MCA, DS, AW and CJ analysed the data and wrote the manuscript. CJ, TH and other members of the BSAC Drug Stability Working Party critically reviewed the manuscript. Funding This study was commissioned and funded by the British Society for Antimicrobial Chemotherapy (BSAC) as part of their Drug Stability Testing Programme in the UK to support outpatient parenteral antimicrobial therapy (OPAT) services. Data sharing statement The outputs of the research are published open access in line with the BSAC policy and will be freely disseminated, including being made available through the BSAC Drug Stability Testing Programme website: www.bsac-dsp.com.